Valentine gifts to make your lovers day! Valentine’s Day: what would you love most? a Vine Share, a gift certificate or fine organic wine? 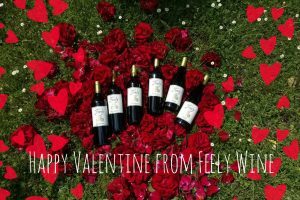 Order a Vine Share for Valentine’s Day (by latest 12 February 2019 for emailed docs) and we’ll add a heart to the personalised name plaque on your lover’s row and offer you a gift of a Chateau Feely leather key-ring with your wine. 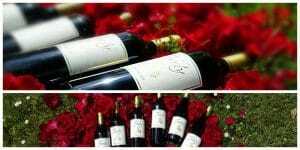 Or perhaps a gift certificate for a romantic two day wine tour with fabulous French food and wine? Or another visit or walking tour . We’ll add hearts to your personalised gift certificate for your lover. Sometimes the simplest gift is the best – make a leaf card and order 12 bottles of fine organic biodynamic natural wine shipped to your door in the EU by 2 February & we’ll send you a gift of a signed copy of Caro’s latest book Glass Half Full called ‘a love story beautifully poured’ (email us if you already have it we can propose an alternative). This option will provide months of shared pleasure rather than just 1 night! Feely pink brut sparkling made in the traditional method (like champagne) will add a romantic touch to your celebrations Order wine shipped to your door in the EU. Read more about it Feely sparkling rosé methode traditionelle brut. This year we also have a WSET level 2 valentine offer – gift your winelover the world of wine or a unique gastronomique getaway in gourmet Perigord. 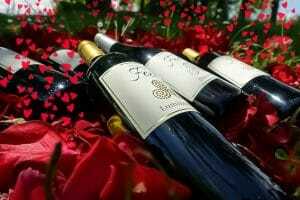 This Valentine’s day we wish you joy, health and love and look forward to seeing you at Chateau Feely. Come and learn more about wine at the wine school or with a visit to Chateau Feely in South West France ; stay or do a multi day course or multi day tour. You can read about the story of this organic vineyard– the series includes three books Grape Expectations; Saving our Skins and Glass Half Full by Caro Feely. Join the mailing list to receive a seasonal newsletter, events, wine pairing, recipes and more info on this topic at the bottom right of this page.